This article is about the species. You may be looking for the ability. Dream Eaters (ドリームイーター, Dorīmu Ītā?) are creatures that debuted in Kingdom Hearts 3D: Dream Drop Distance. They reside in the Realm of Sleep and consume dreams, as their name implies. There are two types of Dream Eaters: benevolent Spirits (スピリット, Supiritto? ), which feast upon bad dreams, and malevolent Nightmares (ナイトメア, Naitomea? ), which plant bad ones. During their Mark of Mastery exam, Sora and Riku recruit Spirit Dream Eater to help them combat the Nightmares plaguing the Sleeping Worlds. The scrapped bunny Dream Eater. Tetsuya Nomura designed the Meow Wow; the others were designed by other staff members. Several Dream Eater designs were scrapped, but the Queen Buzzerfly was revived as a boss. 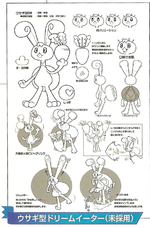 A lapine Dream Eater concept was planned for inclusion at one point, and is depicted in the Ultimania. It would have fought using carrots plucked from the ground. Ava marvels at the newly created Chirithy. During the "age of fairy tales", the Master of Masters creates the first Spirit Dream Eater, the Chirithy, to assist and guide Keyblade wielders in their endeavors. The Master of Masters warns the foretellers that if a Keyblade wielder succumbs to darkness or vanishes, so will the Chirithy. The Chirithy support all five Unions, and though they are not subordinates to the foretellers directly, they work together with them to drive back the darkness. Nightmare Chirithy proclaims that Nightmares like it exist to show people bad dreams, allowing them to sever connections and live freely, a concept that Chirithy is unable to understand. After a fierce battle with Darklings, Nightmare Chirithy absorbs them and becomes a monster. After being defeated, Nightmare Chirithy fades away. Despite Ansem, Seeker of Darkness's defeat, some of the worlds remain asleep. Yen Sid explains they are beyond reach of the Heartless, but they and their Keyholes are instead threatened by Nightmare Dream Eaters. These enemies attack Sora and Riku many times over the course of their Mark of Mastery exam. In Traverse Town, Sora decides to team up with Spirit Dream Eaters after he sees Neku summon a Necho Cat. Riku makes the same choice after Joshua helps him spawn a Komory Bat. When Sora and Riku return to Traverse Town, they learn their friends in that world have forsaken their Dream Eaters for their human Game partners. The Keyblade wielders also encounter the Spellican, which wreaks havoc before escaping to Symphony of Sorcery. There, this powerful Nightmare troubles Mickey Mouse until Sora and Riku come to his aid. In a false version of The World That Never Was, Riku comes face-to-face with Ansem, Seeker of Darkness. The Heartless reveals Riku is a Spirit Dream Eater who spent his entire Mark of Mastery exam inside Sora's dreams. Riku battles Ansem, defeats him, and escapes to the real The World That Never Was. He then locates Sora's Meow Wow and uses the power of his Komory Bat to reach the Castle That Never Was. After an encounter with the real Organization XIII and Sora's successful rescue, Riku returns with King Mickey, Donald, Goofy, and Lea to the Mysterious Tower. To wake Sora, Riku voluntarily plunges back into his friend's dreams and defeats the Armored Ventus Nightmare. Reawakened, Sora watches as Yen Sid names Riku a Keyblade Master. He returns to the sleeping Traverse Town and reunites with his Spirit Dream Eaters. "Look for the light in the darkness." —Chirithy gives a hint to Sora on how to save his friends. Sora and Chirithy in The Final World. Meow Wow and many Spirits appear in the Wonder Balloon Link Summon. Chirithy appears in The Final World, where it speaks to Sora and explains what the world is, and how Sora has been there before. It goes on to explain that Sora arrived there due to his heart and body perishing, but something is holding him there on the edge of death and life. It instructs Sora in what he has to do in order to leave before he disappears. Once Sora finds all the pieces of himself, it returns, somewhat annoyed that he is still hanging around. Sora offers to help Chirithy find its pieces so it can leave, but it informs him it does not "work like that". Like the Unversed, Heartless, and Nobodies, Dream Eaters come in many shapes, sizes, and colors. They resemble real-world animals, and they bear emblems that designate them as either Spirits or Nightmares. While Spirit Dream Eaters are brightly colored, Nightmares are less vibrant. A Spirit Dream Eater's Disposition determines its eye color, while Nightmares' eyes are round, red, and lack pupils. Characters that become Dream Eaters have emblems on their bodies in accordance with their roles. Riku, a Spirit Dream Eater, has the appropriate sigil on his back. Meanwhile, the Armored Ventus Nightmare has one emblazoned on its helmet. Yen Sid compares Nightmare and Spirit Dream Eaters for Sora and Riku. Dream Eaters exist in the Realm of Sleep, where they consume the dreams and nightmares of its denizens. Nightmare Dream Eaters outnumber Spirits, which Sora and Riku must create by collecting the necessary recipes and dream pieces. Spirit Dream Eaters enjoy affection and love playing with Training Toys. Their Disposition determines their eye color and how they behave during combat, while Paint Guns can be used to alter their body color. Spirits lend their power to Sora and Riku via the Link System, and they can compete against others of their kind in Flick Rush tournaments. Dream Eaters listed in italics are exclusive to Kingdom Hearts Dream Drop Distance HD. Dream Eaters listed in bold serve as bosses. ↑ Kingdom Hearts 3D: Dream Drop Distance, Yen Sid: "You'll recall, in your first journey, that you brought many worlds back from the darkness- but some never returned completely. They still sleep, cut off from all outside channels. Not even the Heartless can enter. But these Sleeping Worlds are said to have their own manner of darkness. They are called "Dream Eaters," and there are two kinds- "Nightmares," which devour happy dreams- and benevolent "Spirits," which consume the Nightmares. The Dream Eaters will guide you, just as the Heartless once guided you, to the Keyhole you seek at the heart of each world." ↑ Kingdom Hearts 3D: Dream Drop Distance, Ansem, Seeker of Darkness: "At the start of your test, when you struck out from that tiny island, you saw me there dressed in a robe. Immediately you knew something was wrong. So without even knowing it, you dove into Sora's dream. And you became exactly what that sigil on your back represents: a Dream Eater to protect Sora from nightmares." This page was last edited on 21 April 2019, at 16:15.